So on the occasions that Roxburgh, the head coach of the women’s soccer team at Langley’s Trinity Western University, spent any amount of time watching one of his freshman forwards in motion, he had a precise definition in mind. That’s the very template which in the very least, piques the interest of any U Sports coach in the country. It’s the template or the prime DNA marker which best defines a multi-sport athlete’s ability to make that incredibly rare switch from one post-secondary sporting major to another without skipping a beat. And in her case, quite amazingly, Harvey has done just that, putting two seasons of prime rotation play at an NCAA Div. 1 field lacrosse program to the side and jumping right into the fray as a primary attacking player on U Sports’ most decorated women’s soccer program of the last decade. 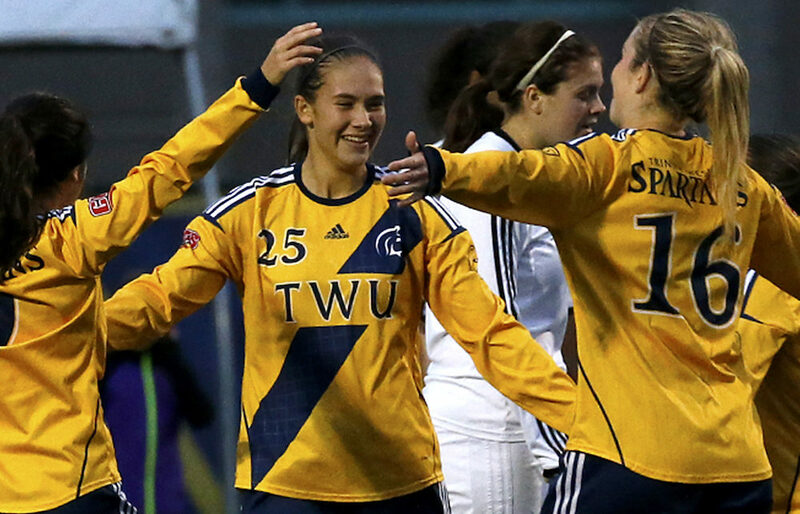 This weekend, after winning the Canada West regular season title behind a 10-3-1 record, the Spartans will be one of four conference teams serving as hosts for the opening quarterfinal round of playoffs. 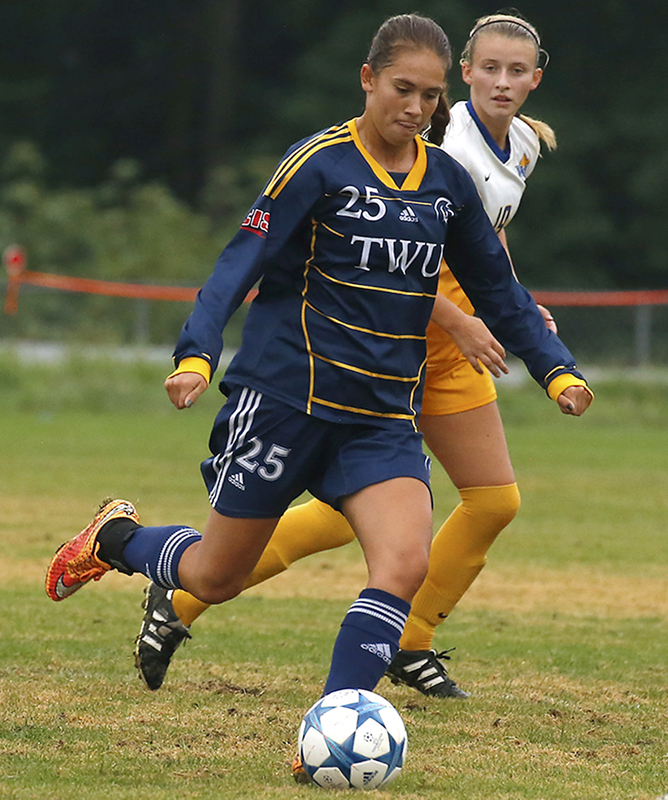 TWU plays host to an opening-round game tonight (7 p.m.) between Lethbridge and Fraser Valley, and will play that winner on Saturday (5 p.m.) for the chance to advance to the conference Final Four semifinals next week. It’s just the kind of athletic setting Harvey was hoping to find coming out of high school. “I am just super-excited,” says the 2015 Dr. Charles Best Secondary grad who as a senior helped lead her high school to the B.C. senior girls Triple A soccer championship, then headed east on a full field lacrosse scholarship in New York City at LIU-Brooklyn. News Item, Sports Information Office, Northeast Conference, March 14, 2016: NEC Rookie of the Week Kathryn Harvey was a driving force behind LIU Brooklyn’s offensive explosion against St. Mary’s. Helping the Blackbirds record their highest single-game goal total since 2009, the rookie midfielder tallied six points in a 22-9 win. Harvey, who scored four goals and dished out two assists in the Blackbirds’ runaway victory, ranks third on the team with seven goals this season. Reference that moment to Harvey and you first get a chuckle, and then an insightful history as to why she chose to hold a stick instead of kick a ball coming out of high school, even though her heart told her otherwise. “When I was younger, I was told that lacrosse was the biggest and fastest growing sport in North America and that it would be easier to get a scholarship that way,” begins Harvey, who was able to excel at the sport, in large part, because of those very traits that Roxburgh saw. “It was weird, but I have always been a soccer player, but so many of my friends played lacrosse, so I did, too and it was a lot of fun. “But when I got to New York, to the East Coast, the coaches there had to teach me how to play. I was just running around, and there were certain common sayings in the sport that they would use and I didn’t even know what they meant. Yet despite all of that, Harvey made an immediate mark as a rookie with the Blackbirds, finishing fifth in team scoring. She played a handful of games last season before a change of heart brought her back to the west coast as a re-invented soccer player, albeit one who had to shake two years of rust. Harvey, in fact, had attended Roxburgh’s Spartan Soccer Academy in her youth and it was there that she first built a connection with her future head coach. “She was part of the same group that (Spartans’ co-points leader Rachel Hutchinson) was a part of,” remembers Roxburgh. “She technically needed to get better but she knew how to move on the field. The best part of all for Harvey, who after not playing for two seasons finished fifth in conference scoring (4-2-6 in 14 games) on the No. 5-ranked team in the country? U Sports now allows student-athletes returning from the NCAA with remaining eligibility to become immediately eligible the next season. And because U Sports doesn’t offer lacrosse as one of its varsity sports, she lost none of her eligibility. So does she plan to use all five of her seasons to play soccer and work towards her degree? Fittingly, as a dynamic mover, her major is human kinetics. Few athletes can transition from one sport to another and perform at such high levels in both, especially at what can still be considered formative years in their athletic development. That’s long way of saying that Kathryn Harvey is a special talent.